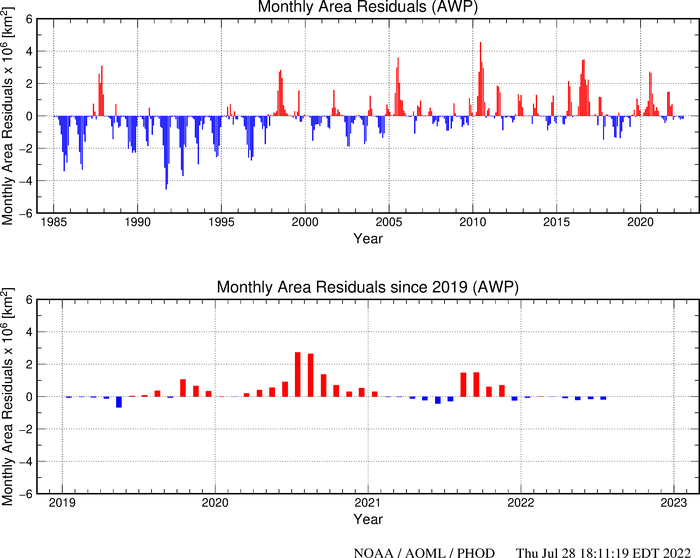 The figure below (upper panel) show the monthly residuals of the warm pool area index, defined as the area inside the 28.5°C isotherm at the sea surface, in the Atlantic Warm Pool (AWP) region. The details of the monthly residuals for the last 3 to 4 years are shown in the lower panel. The monthly residuals for each month is the difference between the mean area index for that specific month and the mean area index value for that month since January, 1985. These time series are updated monthly.